After getting through the Disney Store at the Expo, we headed over to the Dream Store. The line for this store was much longer just to get in and then was quite ridiculous inside. At first we were regretting not going there first, but it all worked out okay in the end because we still got the pins we wanted. The Dream Store was technically laid out more roomier to navigate through than the Disney Store, but it was extremely crowded and the line weaved around through it making it way worse to navigate. To browse the store we had to cut across the line. Then to get into the line, we had to cut across twice to find the end. I think they should have been better limited the crowd inside or have better thought out how the line should go around if people are also trying to wander around browsing in the area the line is winding through. It took us about an hour to just get into the Dream Store. We then soon realized we just needed to get in line because we only wanted pins. Getting through that line took us about 90 minutes. It did seem like forever, but it ended up being worth it because Mik got the pin he really wanted as did I. Mik got the Star Tours Piece of History Pin. 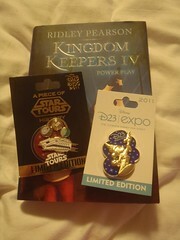 I got the Sorcerer Mickey Annual Pass Exclusive D23 Expo pin. We were also pleasantly surprised that we got to save 20% here with out Annual Pass just like when we shop in the parks.